The 482xl is a high-performance audio transcoder for balanced and unbalanced stereo audio signals. It simultaneously converts balanced stereo signals to unbalanced stereo audio and unbalanced stereo audio signals to balanced stereo audio. 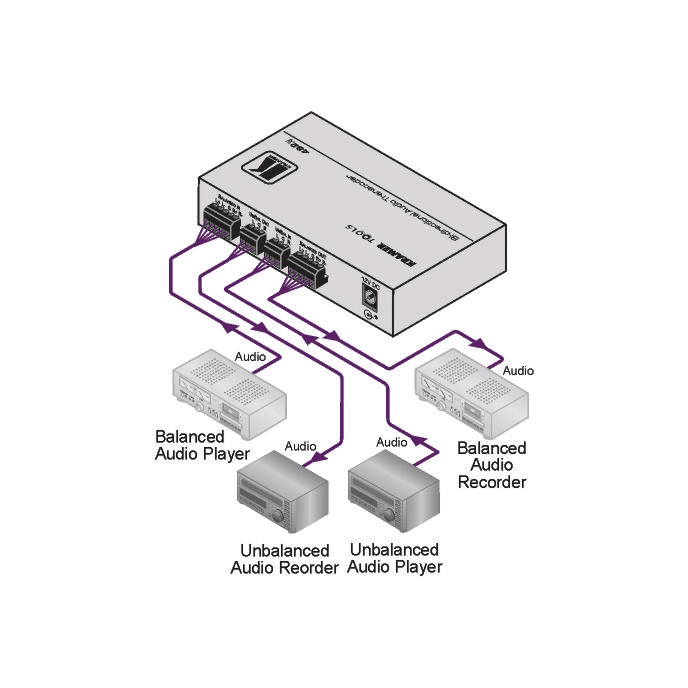 Bidirectional Format Conversion - Balanced stereo audio to unbalanced stereo audio and unbalanced stereo audio to balanced stereo audio simultaneously. Connectors - Terminal blocks (balanced & unbalanced). Level (Gain) Control - Independent L & R adjustment while transcoding for both balanced to unbalanced conversion and unbalanced to balanced conversion. S/N Ratio - 95dB balanced to unbalanced, 87dB unbalanced to balanced, unweighted. Compact Kramer TOOLS - 3 units can be rack mounted side-by-side in a 1U rack space with the optional RK-3T rack adapter.